Entertainment Weekly has released eight new Infinity War photos online. We're still waiting for the full-length trailer, but these photos, and the new information they bring with them, are quite revealing. 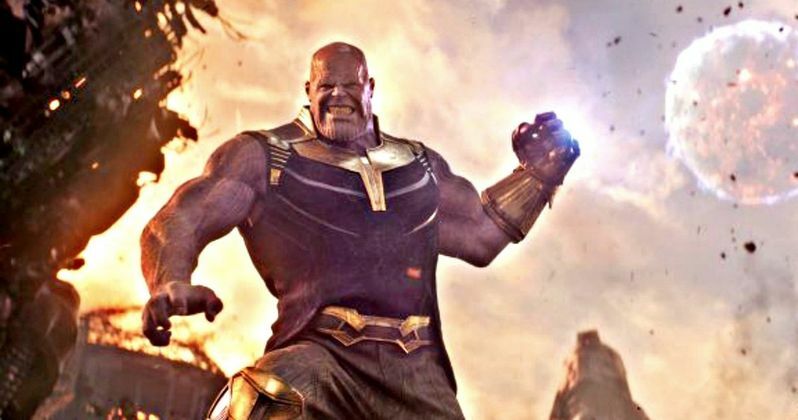 For one, we finally get to see a shot of Thanos throwing a moon, which was seen in footage shown at D23 and San Diego Comic-Con last year. There's been speculation that this may have something to do with Xandar, which is where the Nova Corps is hiding one of the Infinity Stones. However, Marvel says the shot takes place on Titan, which is Thanos' ruined homeworld. The new photos also provide a look at Black Panther's Shuri, who is a "key" part of the movie. There's also a look at Loki, who's seen better days and he's apparently going to partially settle his debt to Thanos by giving him the Tesseract, aka the Space Stone. The Guardians are going to split up in Infinity War, with Gamora leading her own mission. That leaves Thor teaming with teen Groot and Rocket Raccoon on an unknown quest, as we see in one of the new photos. We also have a new look at the battle in Wakanda, which prominently features T'Challa ready for war, as well as shots of Tom Holland's Peter Parker hanging off of a school bus when Thanos arrives and Captain America, Black Widow and Rhodey together. Rhodey is also walking again, thanks to some fancy new tech. The new Infinity War photos also hint at the Illuminati, with a look at the team comprised of Doctor Strange, Wong, Tony Stark and Bruce Banner. From the start, Avengers: Infinity War is going to handle its many characters by splitting them up into teams. But the EW report says that all roads lead to the same place, so it sounds like the teams will ultimately come together. Robert Downey Jr. talked a bit about his team, praising Benedict Cumberbatch as the Sorcerer Supreme. "I love how Cumberbatch just comes in and kind of draws flaming circles anywhere and can basically step into your movie. That's fun. And we wanted to keep a little bit of the Science Bros. thing alive, even though Ruffalo has been on such an amazing Banner/Hulk journey himself. I really, really, really enjoyed getting to know and work with and play around with Benedict as Strange. Benedict Wong also, by the way is fantastic." Robert Downey Jr. also promises that this movie really does have series stakes saying, "Believe me, I'm tired of every movie, you know, 'It's the end! It's Armageddon! It's the Be All, End All, Forever!' And then it's ... not. This one actually is. [Laughs] They're not kidding. This is a heads-will-roll scenario." People are going to die. As for Tony Stark's motivations? He's apparently walked back his role a bit, since his plan in Avengers: Age of Ultron didn't work out so well. But his main motivation is Pepper Potts, as the two have worked things out now and are engaged, as was revealed in Spider-Man: Homecoming. "Pepper remains the heart of the [Iron Man] story. I think we wanted to get back to that reality. Not just for them, but let's really see how that can add to the something-worth-fighting-for of it all." We know many of the Marvel actors are retiring after Avengers: Infinity War and it sounds like Robert Downey Jr. is one of them. "I'm definitely a hang up your jersey before they boo you off the court type guy, just because I still have an appropriate fear of embarrassment," he said. So Avengers: Infinity War, which arrives in theaters on April 27, and Avengers 4 are likely to be his last two movies in the MCU. Be sure to check out the brand new Infinity War photos, courtesy of Entertainment Weekly, for yourself below. You've been waiting to see #Thanos rip a moon out of orbit and throw it, right?